Ole Miss’ athletics program has been under NCAA scrutiny since 2012, when an investigation into its women’s basketball team spiraled and eventually put the football and track & field teams in hot water. In April 2016, the NCAA issued a Notice of Allegations of 13 supposed football violations relating to academic fraud, booster problems, and illegal recruiting tactics. The NCAA alleged eight more infractions in a Feb. 2017 NOA, and 15 of the 21 violations were Level 1, the highest level. 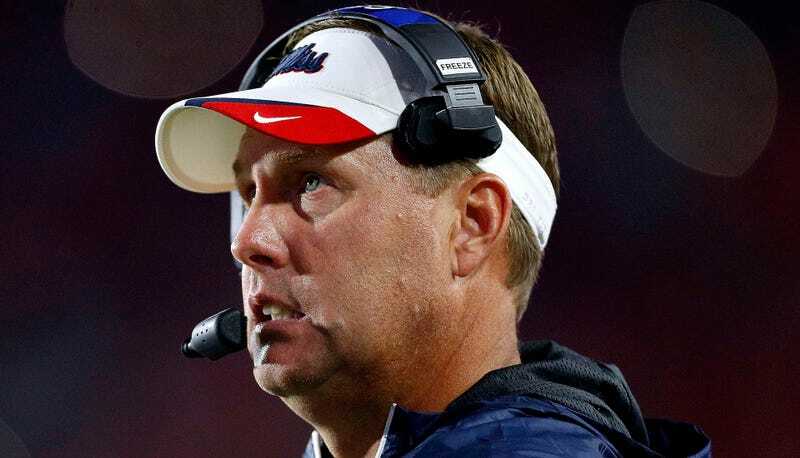 Several of the alleged transgressions occurred under previous Ole Miss coach Houston Nutt’s watch, but most of the alleged violations occurred during current coach Hugh Freeze’s regime. When the NCAA issued its second NOA, they upgraded the prior failure to monitor charge regarding Freeze’s control over the program to a Level 1 lack of institutional control charge, and also charged Freeze with violating his head coach responsibility legislation. Shortly after the second NOA surfaced, Ole Miss self-imposed a one-year postseason ban for the 2017-18 season, although the investigation remained open with further penalties possible. Freeze has beaten Alabama twice and helmed Ole Miss to two New Year’s Six bowl games, but it seemed that Ole Miss might need to shed Freeze in order to move on from the extensive scandal. Ole Miss responded to the allegations this afternoon in a lengthy letter (which you can read in full below), and while they acknowledged many of the violations, they also disputed the most serious among them, including the lack of institutional control charge. They claimed that Freeze was aggressive about compliance and that no compliance system could have caught those who the university seeks to portray as rogue actors. This defiant rebuke looks like a sure sign that Ole Miss will stick with Freeze and try to ride out the investigation. In particular, none of the Level I violations in this case could have been prevented, detected, or deterred by any reasonable compliance or monitoring system, especially those violations committed by relatively unknown boosters who acted on their own or individuals who intentionally avoided monitoring systems and hid their actions from the University’s compliance and coaching staff. The school is pinning former Hugh Freeze assistant Barney Farrar—whose name popped up in draft night text messages that indicated Laremy Tunsil was getting paid while at Ole Miss—with a lot of the blame. Farrar’s attorney told Yahoo Sports last week that his client was being scapegoated by the school and portrayed as a rogue actor. Ole Miss claims Farrar used a private phone to keep in touch with recruits and keep his activities (which allegedly include paying off recruits and arranging illegal benefits packages) hidden from Freeze and the school. The school also poked holes in the testimony of [Student-Athlete 39], a former Ole Miss recruit now playing for Mississippi State who received immunity in exchange for testimony about how he received between $13,000 and $15,000 in cash from a booster. Ole Miss dedicated several pages to picking apart the timeline of events that he provided to investigators. They also pointed out that the recruit used a Joker .gif to celebrate the second NOA. The NCAA will soon decide whether to accept Ole Miss’ self-imposed penalties or levy new penalties of their own. Keeping Freeze around probably means that they believe their own self-inflicted postseason ban and forfeiture of SEC postseason revenue will be enough for the NCAA and that Freeze will not have to go. The school will meet with the NCAA Committee On Infractions later this year.